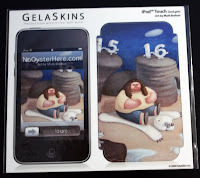 For the third prize draw we have two iPhone Gelaskins and 1 17" laptop gelaskin that were given away at the Super 7 Store in San Francisco as part of the 12th poster reveal. There will be three winners for this prize. 1. What is the name of the guitarist in Charlie's band Drive Shaft ? 2. What is the title of Drive Shaft's second album ? 3. Which "wrong" item did 5-year-old John Locke pick when visited by Richard Alpert ? 4. Name at least three characters who were born on the island ? 5. What was the name of Charles Widmore's freighter that exploded near the island ? Thanks to Spy Hill Skates for the questions. Submit your answers by clicking here and entering the information into the entry form. This same form will be used for each prize. Make sure you choose PRIZE 3 from the selection drop down. These draws are free for all to enter, but if you can spare some money then UNICEF is charity that does good work in over 150 contries. Click here or the logo if you wish to donate. Wow I'm the first one to make a comment in this post?! I got to sleep in today 2 hour snow delay. yipee! Just so you don't feel lonesome SG! I totally missed the fact that there were new posts. Oops. I put in "Either" instead of "Laptop". In the bizaare chance that I may win, can I render my "either" answer void and choose "laptop" instead? Got my answers in, chose either cause I'm getting an iphone in a couple months. That would be so fricken cool to put on an iphone! !